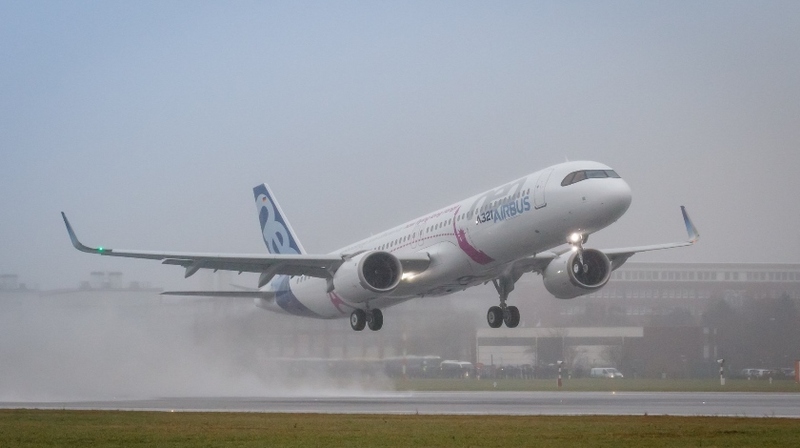 The first A321LR (Long Range) has taken off on its maiden flight from Hamburg Germany at 11:06 hrs local time, commencing its flight test programme. The aircraft, MSN7877, is powered by CFM LEAP-1A engines. The aircraft’s crew comprised: Experimental Test Pilots Yann Beaufils and Peter Lofts as well as Flight Test Engineers Frank Hohmeister, Jim Fawcett, Cedric Favrichon and Cabin Specialist Alexander Gentzsch. The aircraft is now set to undergo a nearly 100 hour flight test programme, including transatlantic missions, for EASA and FAA Type Certification in Q2 2018. Entry into service is targeted for Q4 2018. With further options, combining an increased Maximum Take Off Weight (MTOW) of 97 tonnes and a third Additional Centre Fuel Tank (ACT), the aircraft’s range extends to 4,000nm (7,400 km), allowing airlines to tap into new long range market opportunities. Incorporating the latest engines, aerodynamic advances, and cabin innovations, the A321neo offers a significant reduction in fuel consumption of 20 percent by 2020. With more than 1900 orders received from over 50 customers, to date the A321neo has captured a solid 80 percent of market share, making it the true aircraft of choice in the Middle of the Market.